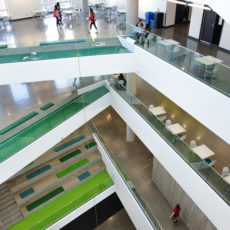 Enter Allard Hall at MacEwan University from any of the main doors and find yourself in the Atrium, the focal point of this stunning building designed by architect Bing Thom. This inspiring space serves as the lobby for the Betty Andrews Recital Hall and the Triffo Theatre. It is ideal for event intermissions, receptions and art installations. For this project we worked closely with the architect, design team and university to ensure the success of the students and that the goals of the university were met. 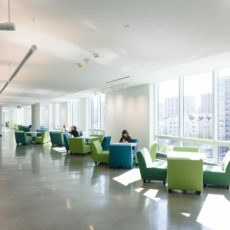 Design played a crucial role shaping the development of the University and their drive for student success. We selected key pieces that could stand the test of time and put up with the daily wear and tear from the heavy student traffic. 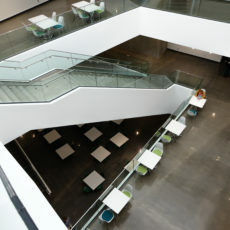 The atrium has some of Herman Miller's key products finished in the school colors, strengthening the culture and comfort of the space.